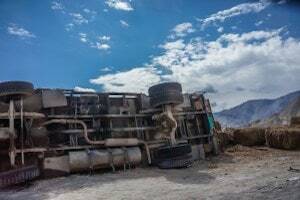 Truck rollover accidents in California are responsible for many injuries and/or fatalities each year. Motorists are well aware that SUVs and light trucks are prone to these types of accidents because they have a higher center of gravity, but tractor-trailers are even more unstable. Experts say that commercial trucks are about one-third less stable than your average car. This makes them prone to flipping and rolling. Government agencies recognize two types of rollover crashes. Tripped crashes occur when a vehicle hits a curb, traffic barrier, overpass, car or other obstacle. Untripped crashes are caused by momentum and centrifugal or centripetal force, including loss of traction, unsafe steering and driving at excessive speeds. These are the most common causes of such accidents. Rollovers cause a disproportionate number of fatalities. Among truck-involved accidents, about 10 percent of fatalities happen when the vehicle flips. A large truck can roll over at low speeds while driving on slopes, navigating turns or backing up in a jack-knifed position. Aging roadways and increased truck traffic are partly to blame. In California, fatalities caused by truck accidents fell for three consecutive years between 2008 and 2010, but they’re on the rise again. According to the National Highway Traffic Safety Administration, the number of trucks that travel on the nation’s roads has more than doubled from 7.8 million to 15 million in the past 15 years. More cargo is hauled by truck than ever before. According to the American Trucking Associations, big rigs carried nearly 10 billion tons of freight in 2014. Many of these large trucks travel on crowded highways in and around Los Angeles. In these areas, motorists share the road with a large number of other passenger vehicles and heavy trucks. Statistics from the state’s Traffic Census show that trucks represent 20 to 30 percent of traffic on some roads. Sections of Route 1 and Route 3 are dominated by trucks. On parts of Interstate 5, one-third of daily traffic is from trucks. This doesn’t include particularly dangerous sections of road like Cejon Pass, which is also called the Grapevine. Recently, a dump truck driver lost control, crushed a car and injured five occupants on an exit ramp off 15 Freeway. Although highways are dangerous, deadly accidents often happen on exit ramps. In many big cities, trucks flip over and roll when they take poorly designed ramps at unsafe speeds. Safety experts are working on ways to improve conditions in hazardous areas where multiple wrecks have occurred. More manufacturers are designing long-haul trucks with electronic stability controls that take over braking. However, these systems don’t perform well on slick or wet roads that compromise traction. The American Transportation Research Institute is working on an in-cab warning system that would alert drivers when they approach dangerous areas. Organizers have already pinpointed hot spots for rolling and flipping in 39 states. Unfortunately, even the most robust safety systems cannot correct maintenance issues or prevent driver errors. After a truck loses control, it’s common for cargo to shift and intensify the flipping motion. Tankers increase the level of risk significantly by hauling partial loads that slosh and create an unsafe directional force. Truck drivers are also guilty of driving while distracted or fatigued. The California Vehicle Code has explicit laws against distracted driving. Sections 23123 (a) and 23123.5 (a) forbid driving while talking on a non-hands free device or while texting. If a driver was talking or texting before the accident occurred, cell phone records will be valuable evidence in a personal injury or wrongful death case. Maintenance records, shipping documents and driver forms can also show who contributed to an accident. According to the Insurance Research Council, accident victims who work with a lawyer recover 3.5 times more compensation than those who go it alone. If you were injured in an accident with a truck or a passenger vehicle, contact a California truck accident attorney today to discuss your case.